Located at the confluence (sangam) of two sacred rivers, the Ganges and Yamuna, as well as the mythical Saraswati River, Allahabad, or the "city of God," is one of India’s most holy and historic cities. This location is where, according to Hindu legend, Brahma performed the first fire sacrifice. Once the ancient Hindu holy site of Prayag, it still draws pilgrims, who come to bathe at the sangam every year during the Magh Mela festival. It was given its present name by the Mughal emperor Akbar, who established his city here in the 16th century and built its great mosque, palace, and fort. The fort contains a link to the city’s Buddhist past, a sandstone pillar inscribed with the edicts of the Mauryan emperor Ashoka. It was from the ramparts of Akbar’s fort that the announcement that India would come under direct British rule was made in 1858, following the Great Rebellion of 1857, a mutiny by the Indian soldiers (sepoys) of the British East Company’s army. In the late-19th century, the city became a center of the Indian Independence movement and it is also the birthplace of Jawaharlal Nehru, India’s first prime minister, and Indira Gandhi, his daughter, also a prime minister. India's most revered river, the Ganges, or Ganga, is formed by the merging of two mountain streams, the Bhagirathi, which is fed by the melting of the Gangotri glacier, and the Alaknanda, at the village of Deoprayag in the foothills of the Himalayas. The Ganges flows parallel to, but several hundred miles south of, the Himalayas as it crosses northern India on its route east to the Bay of Bengal. Its tributaries bring down sediment-filled water from the mountains, which help create a wide, fertile plain that provides food and sustenance for nearly a billion people. The river has played a vital role in the growth of the civilizations that developed along its shores, not only in terms of agriculture but commerce as well, and been worshipped by Hindus since ancient times. According to Hindu mythology, the Ganges is a goddess, Ganga, who dwelled in the heavens until a human king, Bhagiratha, prayed to the god Brahma to have her descend to Earth. Bhagiratha made this request in order to help cleanse and release the souls of his ancestors who had been burnt to death and condemned to wander in the nether-world. Although Brahma granted Bhagiratha's wish, Ganga was displeased and threatened to descend with such force that it would destroy the Earth. 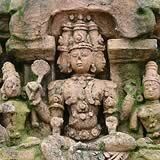 Bhagiratha then prayed to the god Shiva, who caught Ganga in his hair and released her in small streams to the Earth. Brahma, the creator of the universe, is one of the three principal gods of Hinduism, along with Vishnu, the preserver of the universe, and Shiva, the destroyer of the universe. Brahma is not the focus of regular worship as Vishnu and Shiva are and has the fewest number of temples dedicated to him. Brahma is commonly depicted with four heads that symbolize the four cardinal directions and four arms with hands clasping prayer beads (or a scepter), a bow, a water bowl, and a book, the Vedas. Brahma's consort is Sarasvati—the goddess of wisdom, music, and the arts—who is worshipped independently of him, and he is often shown riding a swan or a male goose. There are rival stories as to how Brahma came into being. In one legend, Brahma, and the world along with him, was born (without a mother) in the lotus that grew from the navel of Vishnu, who was sleeping on the serpent Ananta (or Sesa), floating on the cosmic ocean. In another, Brahma became the universal progenitor after emerging from a golden egg that developed from a seed that Brahman (the supreme being) had deposited into the cosmic waters. Brahma's methods of creation include copulation, thinking things into existence, and dismembering or sacrificing his body parts to form other entities. Traveling to places of religious import, whether temples, shrines, or cities, is a familiar part of every major faith in India. Found throughout the country, these sacred locations draw pilgrims because they are thought to bestow special blessings or spiritual knowledge. Pilgrimage has been a long-standing tradition within Hinduism. Many of the sites that Hindus visit are temples devoted to the life of a particular deity. Other destinations are found near rivers, the most sacred of which is the Ganges, where the faithful go to perform religious rites and bathe in the waters in order to be absolved of sins. In Buddhism and Jainism, pilgrimage sites are connected to the life of the religion’s founders and the leaders and holy persons who followed and contributed to the faith's dissemination. Buddhist shrines developed around relics of the Buddha's body and important events in his life. Bodhgaya, in Bihar, where the Buddha achieved enlightenment, and Sarnath, in Uttar Pradesh, are among the most famous centers of pilgrimage. For Jains, places where the faith's teachers (tirthankaras) achieved enlightenment, as well as locations that are home to famous temples or sculptures, are among the sites that draw pilgrims. The tombs of Sufi saints of the Chishti order, who thrived in India during the thirteenth and fourteenth centuries CE, are the focus of Muslim pilgrimage in India and Pakistan. The shrine of one saint, Moinuddin Chishti, in Ajmer, Rajasthan, is especially venerated and attracts thousands of pilgrims during the Urs, the annual festival to mark the anniversary of his death. Even Hindus are known to worship there. Although pilgrimage is not a part of Sikhism, devotees do journey to its foremost place of worship, the Golden Temple in Amritsar, Punjab, as well as locations associated with the lives of its ten gurus (spiritual leaders). 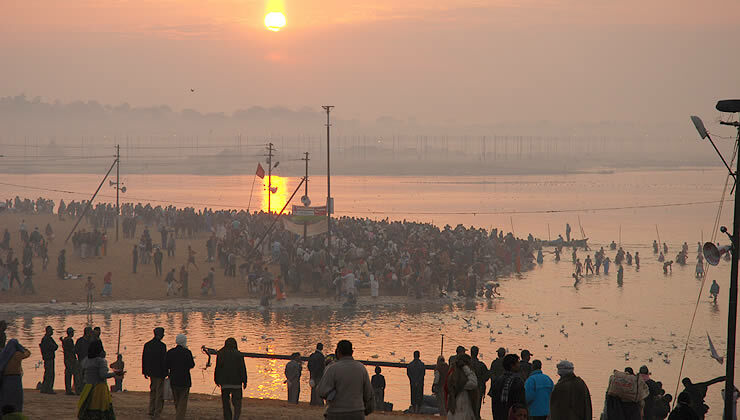 The annual festival held in Allahabad, formerly called Prayag, where three sacred rivers meet: the physical Ganges and Yamuna rivers are said to be joined here by the invisible, heavenly Saraswati River. This confluence is known as the Triveni Sangam and it is where, according to Hindu legend, Lord Brahma (the God of creation) performed the first fire sacrifice. The location is considered especially auspicious during the Hindu month of Magha (January to February) on the day of the full moon and the new moon. Each year during this time, thousands of pilgrims travel to the city to take a ritual bath in the confluence to wash away their sins and increase their chances for salvation. In addition, they perform pujas (religious rituals), meditate, and mingle and listen to the addresses of Hindu holy men. A temporary tent city emerges on the river's banks to accommodate the faithful. Allahabad (Prayag) is also believed to be one of four holy sites where a few drops of immortal nectar fell to Earth from a jar (kumbh) being fought over by the gods and demons. Every 12 years, millions of pilgrims converge on the city for the Maha Kumbh Mela, the world's largest religious gathering—with 25 million on the chief bathing day in 2001. You need Flash Player version 9.0.115 or greater to view this video. Jalaludin Muhammad Akbar (Akbar the Great) became the third emperor of the Mughal Empire while just a teenager and ruled from 1556–1605. Spending half of his reign at war, he consolidated Mughal power and expanded the empire to Gujarat, Bengal and Kabul—not since Ashoka's reign nearly 2,000 years earlier was so much of India united under one ruler. Extensive land surveys and assessments enabled Akbar's territorial expansion and attempted to protect peasants from unfair taxes. Other administrative reforms included a system of military ranking that required nobles to raise troops for the military and increased loyalty to the emperor by making nobles directly responsible to him for their rank. Akbar's reign saw lucrative trade with Europe, especially in cotton textiles, and word of his achievements and reputation spread to that continent. In 1585, Elizabeth I sent an ambassador to India bearing a personal letter to Akbar, who was on a military expedition and did not meet with the English emissary. Akbar and his chief advisor, Abu'l Faz'l (who wrote Akbar–nama, a year–by–year account of Akbar's reign) linked kingship with divinity, redefining the ruler as a military, strategic, and spiritual leader. Recognizing that hatred among the various religious groups threatened to undermine the empire, Akbar, himself a Muslim, promoted racial tolerance and religious freedom under the policy of "universal tolerance" or "sulahkul." He appointed Hindus to high positions in his cabinet, married Hindu women and abolished taxes levied against both Hindus and non–Muslims. A student of comparative religion, he welcomed visitors of all faiths—including Jains, Jesuits, Hindus and Zoroastrians—to his court. Discussions with these visitors led him to develop his own religious teachings, Din–i–Ilahi or "divine faith," that sought to transcend sectarian religion. Music, art and literature flourished in Akbar's cosmopolitan court. Although he never learned to read and may have been dyslexic, he collected an imperial library of over 24,000 volumes and commissioned translations of many works, including the Ramayana and Mahabharata. Akbar's fort at Agra that included five hundred buildings and his city of Fatehpur Sikri illustrate the architectural style developed under his rule. In 320 BCE, the Nanda dynasty was overthrown by an officer in its army, Chandragupta Maurya (c. 320-298 BCE), and thus began the Mauryan Empire. By around 300 BCE, Chandragupta's empire included India south of the Hindu Kush and most of northern India as far south as the Narmada River. Writings of a Greek ambassador, Megasthenes, provide insights into the wealth and splendor of the Mauryan capital at Pataliputra (Patna), India's caste system, and the king, who Megasthenes wrote was constantly vigilant, fearing attempts on his life. A book about statecraft, Arthasastra, written in part by Chandragupta's head minister (additions were added in later centuries), discusses practical advice for rulers about how to run a kingdom and provides a window into Mauryan bureaucracy. Legends about Chandragupta are many and claim his family was related to the Buddha, that he met Alexander the Great, and that he resigned his kingship to become a Jain monk. Ashoka the Great (c. 269-233 BCE) is largely considered the greatest Mauryan emperor and ruled over a territory stretching from the northern Himalayas into peninsular India and across the widest part of the subcontinent. Known for his principles of non-violence and religious tolerance, Ashoka modeled himself as a cakravartin, the Buddhist term for a "universal ruler," whose rule was based on the principle of dharma or conquest not by war but righteousness. To advance this principle, Ashoka had edicts based on the dharma carved on rocks, pillars, and caves throughout his kingdom and sent emissaries abroad to disseminate his views. After Ashoka's death, the empire declined and lost territory under a series of weak rulers about whom little is known. In 185 BCE, Pushyamitra Shunga, a general, assassinated the last king of the Mauryan dynasty, Brihadratha. Ashoka (Asoka), the third emperor of the Mauryan Empire, reigned from c. 269-233 BCE, and his exemplary story remains popular in folk plays and legends across southern Asia. The emperor ruled a vast territory that stretched from the Bay of Bengal to Kandahar and from the North-West Frontier of Pakistan to below the Krishna River in southern India. The year 261 BCE marks a turning point in Ashoka's reign when, in part to increase access to the Ganges River, he conquered the east coast kingdom of Kalinga. 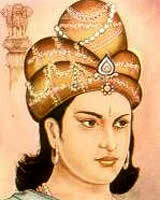 By Ashoka's account, more than 250,000 people were killed, made captive or later died of starvation. Feeling remorseful about this massive suffering and loss, the emperor converted to Buddhism and made dharma, or dhamma, the central foundation of his personal and political life. Throughout his kingdom, the emperor inscribed laws and injunctions inspired by dharma on rocks and pillars, some of them crowned with elaborate sculptures. Many of these edicts begin "Thus speaks Devanampiya Piyadassi [Beloved of the Gods]" and counsel good behavior including decency, piety, honoring parents and teachers and protection of the environment and natural world. Guided by this principle, Ashoka abolished practices that caused unnecessary suffering to men and animals and advanced religious toleration. To further the influence of dharma, he sent his son, a Buddhist monk, to Sri Lanka, and emissaries to countries including Greece and Syria. To some historians, the edicts unified an extended empire, one that was organized into five parts governed by Ashoka and four governors. After his reign, Ashoka has become an enduring symbol of enlightened rule, non-violence, and religious tolerance. In 1950, the Lion Capital of Ashoka, a sandstone sculpture erected in 250 BCE, was adopted as India's official emblem by then Prime Minister Jawaharlal Nehru. The Great Rebellion of 1857 (also called the Indian Mutiny, Sepoy Rebellion, and First War of Independence) began as a mutiny by Bengal army soldiers, or sepoys, against their commanders in the army of the British East India Company. The rebellion came out of the sepoy's long-held grievances about unfair assignments, low pay, limited opportunities for advancement, and the reorganization of Awadh, a region from which a third of them had been recruited. A more immediate cause of insult to the sepoys was the new Lee Enfield rifle that required soldiers to reload by biting off the ends of cartridges greased with pig and cow fat, substances offensive to both Muslim and Hindu religions. On May 10, 1857, the sepoys posted in Meerut attacked officers and marched on Delhi after their colleagues had been punished for refusing to use the new cartridges. Once in Delhi, the uprising gained legitimacy when the sepoys made the 82-year-old Mughal emperor Bahadur Shah II the leader of their rebellion. Other soldiers, primarily those stationed in northern India, joined the revolt, and popular uprisings also broke out in the countryside. Central India and the cities of Delhi, Lucknow, and Cownpore (Kanpur) became the primary areas of unrest while areas further south, where the Bombay and Madras armies and many princes and elites remained loyal, were largely untouched by the rebellion. By September, the British had regained control of Delhi, exiled Bahadur Shah, and killed both of his sons. After the siege of Gwalior in the summer of 1858, the British regained military control, and those sepoys who had revolted were severely punished—a number of captured sepoys were fired from cannons. The army was reorganized to include a higher ratio of British to Indian soldiers, recruitment focused on regions that had not revolted, and units were composed of soldiers representing many Indian ethnicities, so as to prevent social cohesion among sepoys. Loss of British revenue as a result of the rebellion was severe, and in 1858, an act of the British Parliament transferred the East India Company's rights in India to the Crown. The new administration of India included a British secretary of state, viceroy, and 15-member advisory council. In 1876, Queen Victoria declared herself Empress of India. Jawaharlal Nehru (Panditji or Pandit Nehru), India's first prime minister, was a committed social reformer, skilled orator and Mahatma Gandhi's political heir. Born into a wealthy family and educated at Trinity College, Cambridge (England), Nehru succeeded his father, Motilal Nehru, as leader of the Indian National Congress in 1929. 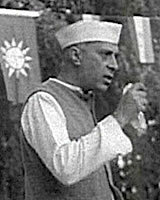 Imprisoned nine times by the British for his nationalist campaigns during the 1930s and 1940s, Nehru wrote his first book, The Discovery of India, a history of India, during a prison term. Nehru served as prime minister from 1947 to 1964, and the first two decades of India's independence might be called the Age of Nehru. Social reforms during this period included land redistribution, removal of barriers to inter-caste marriage, and women gaining the right to sue for divorce. To advance his economic ideals, Nehru formed and headed a National Planning Commission that developed three five-year economic plans focused on state-directed rural development, agriculture, and industry. In foreign policy, Nehru advocated nonalignment, taking the side of neither capitalism nor communism in the Cold War. Noninterference and peaceful co-existence were his goals with countries in the region, including China. However, that stance was untenable after China invaded Tibet in 1959, after which India gave the Dalai Lama asylum. Although still controversial, Nehru's legacy is one of faith in democracy, constitutional authority, and secularism. His daughter, Indira Gandhi, served as prime minister of India from 1966 to 1984. How does the massive pilgrimage to Allahabad in modern times illustrate India's historical spirituality? How was Nehru's policy of non-alignment during the Cold War a reflection of India's past? 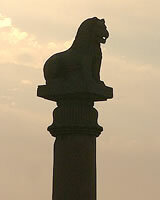 What is the symbolism associated with Nehru's selection of the Lion Capital of Ashoka as the national emblem? While the Great Rebellion of 1857 attempted to rid India of the British, how did Britain subsequently change its ruling style to gain an even stronger foothold in the subcontinent? The Story of India is made possible by contributions from viewers such as yourself and also by Patak's Indian foods.